Starting third, Chase Briscoe, driver of the No. 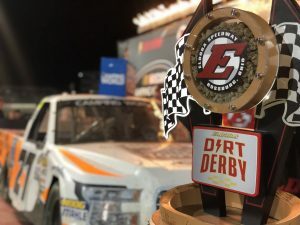 27 Ford Performance F-150, won the Sixth Annual Dirt Derby at Eldora Speedway in New Weston, Ohio, after battling it out with ThorSport Racing teammate Grant Enfinger on the last lap. Nabbing his second career NASCAR Camping World Truck Series (NCWTS) win, and his first career victory at Eldora, Briscoe earned ThorSport Racing their 28th victory in 23 seasons of competition in the series, and their second win at the 1/2-mile dirt oval. Briscoe’s first career victory came in 2017 at Homestead-Miami Speedway for Ford Performance-backed Brad Keselowski Racing. Crossing the finish line first in this year’s race at Eldora, Briscoe earned Ford Performance their 97th victory in NCWTS competition after leading 54 of the event’s 153 laps.